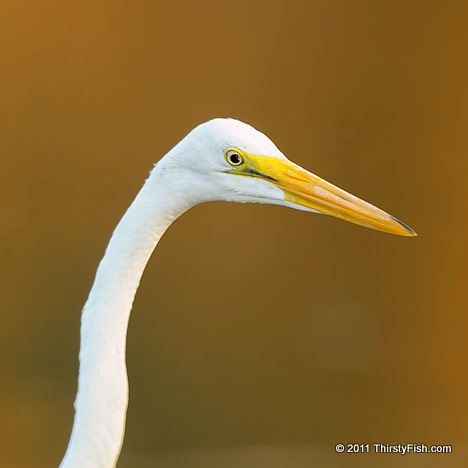 Taken in early fall, the golden background of this Egret Portrait is set by the reflections of fall trees on water. Although fill flash was used, there is absolutely no substitute for quality light. Typically, fill flash is used when the background is significantly brighter than the subject, or, to fill in the shadows under harsh light (e.g. outdoors on sunny days). In this photograph, even though the background is darker than the Egret, the fill flash provided dimensionality to the feathers, helped isolate the bill from the background and added a little catch light in the eye.